The Lamentation • Joe Forkan 2006-2011 Oil on Linen 72" x 40"
Here is another recently completed painting from The Lebowski Cycle. 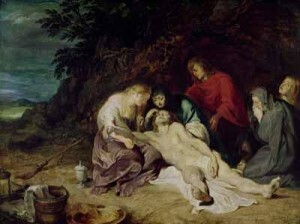 This one is titled The Lamentation, and I was working with a couple of specific Lamentation paintings in mind (by Rubens and Giotto), but I was also looking to the larger tradition of paintings dealing with this subject matter. What interests me about paintings from the Passion is the complex appeal to emotion that floats through them. But that appeal is complicated by the passage of time and the shifting cultural context through which the work is seen, and by the conversation that surrounds the art (the historical importance of the paintings, the biography of the artist, the formal and stylistic structures of the depictions, etc.). “…You look at the art of the Renaissance, mostly created by the Roman Catholic Church and commissioned by the Roman Catholic Church. 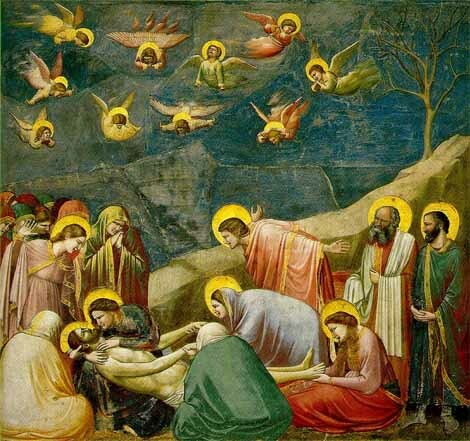 Does Renaissance art as it has manifested itself over 400 years represent the church? It does not represent the church. The kind of art we like today became the kind of art we like today because people took that art and used it for their personal ends. They disregarded its ideological content, and took it to mean something that they valued. So, if you like a Caravaggio today, that doesn’t mean that you believe in the Counter-Reformation principle of the communion, right? And so, well, then what do we like? Meaning is always migrating. But with all of this ebb and flow, it can be a bit of a shock to wander through a museum paying close attention to the fact that, no matter what the intentions of the artists, a huge percentage of these lovingly crafted works of art are brutal, grizzly images of cruelty, torture, suffering, death, and grief. The body count is truly staggering. How many times have artists crucified Christ or skewered St. Sebastian? 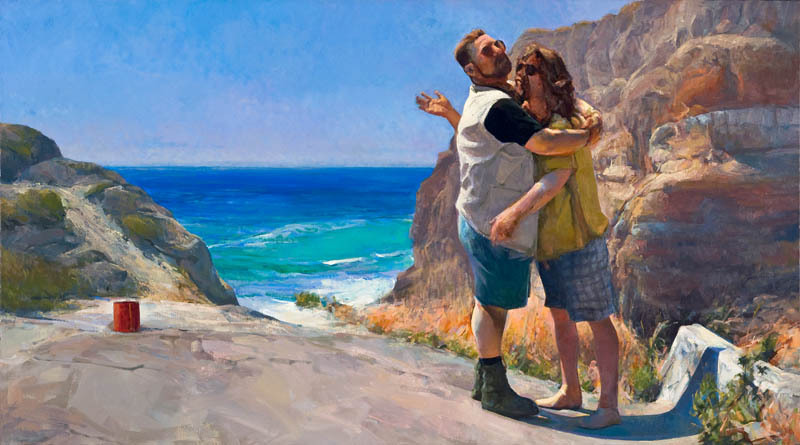 This entry was posted in Figurative Painting & Drawing, The Lebowski Cycle and tagged Caravaggio, Christ, Counter-Reformation, Dave Hickey, Giotto, Peter Paul Rubens, Roman Catholic Church, St Sebastian, The Big Lebowski, The Dude, The Invisible Dragon: Four Essays on Beauty, The Lamentation, The Lebowski Cycle on July 22, 2011 by Joe Forkan. Would like to purchase the labowski painting above. Sorry for the late reply. Shoot me an e-mail if you’re still interested in an original, and I’ll send you prices. Is The Lamentation available as a print?